chesyrockreviews.com: FM to re-record iconic album Indiscreet! FM to re-record iconic album Indiscreet! 30 years on we are happy to announce that we have decided to record a modern-day version of our classic debut album INDISCREET. We have been asked many times if we would consider re-recording some of these tracks using today's modern technology and recording techniques and giving the songs the sound of FM as it is today. We realise what an iconic album this is to so many fans so we have always steered clear of tampering with it too much but whilst in the studio recording the follow-up to HEROES & VILLAINS one night at the end of a session we decided to put down a backing track to "That Girl" to see how it would sound with the huge sounds we were getting at the time. It gave the song a new dynamic and power that we couldn't achieve in the 80s. We played it back the following morning and decided it would be great to hear all these classic songs with this new lease of life. We are not trying to recreate the original but this is our interpretation played by FM as we are today with the sound of FM 2016. In addition to the re-recording of the original album, INDISCREET 30 also features seven bonus tracks including brand new song "Running On Empty" and a new recording of "Let Love Be The Leader". 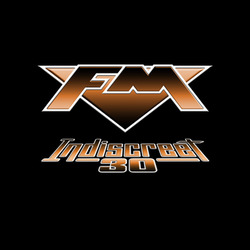 INDISCREET 30 was produced by FM, recorded at Tremolo Studios and Coal House Studios, Staffordshire and mixed by Jeff Knowler (METROPOLIS, ROCKVILLE and HEROES & VILLAINS). 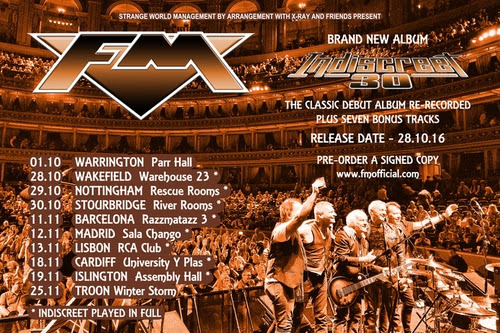 Signed copies of INDISCREET 30 are available to pre-order now from the FM webshop [http://www.fmofficial.com/fmofficial/preorder-indiscreet-30.html]. INDISCREET 30 will be mailed out to you four weeks before release date. Closing date for this special offer is Monday 26 September 2016. INDISCREET 30 will also be available at the merchandise stand at the Warrington Parr Hall show Saturday 1st October and all other shows. Preview "Love Lies Dying" from INDISCREET 30 on the FM Soundcloud page [https://soundcloud.com/fmofficial/love-lies-dying].